New GigaJuke music systems arrive from Sony | What Hi-Fi? The GigaJuke NAS-SC500PK (£850) has a 160GB hard drive, while the NAS-E300HD (£300) makes do with 80GB. Sony claims the 160GB model can store up to 1300 hours of music at a bit-rate of 256kbps, or 40,000 standard MP3 tracks. Both GigaJuke systems can record directly from CD, and can store music from various sources including CD, radio, PC and vinyl. The flagship NAS-SC500PK supports MP3, AAC, linear PCM, WMA and ATRAC music files, and can support up to five wireless client players in other rooms. The NAS-E300HD supports MP3, AAC and WMA. Files can be transferred from a PC to the GigaJuke using the supplied Music Transfer software, either via a LAN cable that directly connects a PC to the GigaJuke, or wirelessly through a broadband router. The built-in Gracenote database contains 350,000 album titles, and can be updated by connecting the system to the internet. 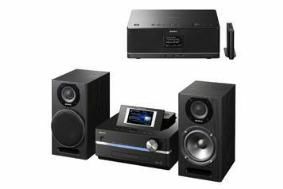 As for sound quality, the stereo speakers supplied have been upgraded, with a redesigned woofer and Sony's Digital Sound Enhancement (DSEE) technology. Power delivery is a claimed 100W for the'SC500PK, and 60W for the junior model. Additional features on the top model include a built-in Walkman WM-PORT, a USB port for connecting other portable devices and Sony's SensMe channels feature which categorises your music into 27 "mood channels". Both new GigaJuke models will go on sale in the UK in mid June.